There are two main types of yard in use; circular and rectangular. Either style can be effectively teamed with a new herringbone or rotary milking parlour. While some farmers have their own preference as to the style of yard required, your site may suit one style more than another. There are generally two types of circular yard; a 3/4 or 7/8 circle, or a full circle. The former is generally only used for dairies milking up to perhaps 200 cows. Whilst it has good cow flow characteristics it is not particularly well suited to handling two herds. Full circle yards can handle larger herds, and when equipped with our twin backing gate system, afford great flexibility to the handling of two or more herds at each milking time. Drive units are heavy duty electric or water powered, and wash up can be easily automated with a washing bar on a backing gate. Rectangular yards can be fitted with ‘lift up’ backing gates to allow the gate to travel back over a second herd loaded behind the backing gate, and then drop down to bring them forward. Again, yard washup can be automated with a washing bar on the gate. 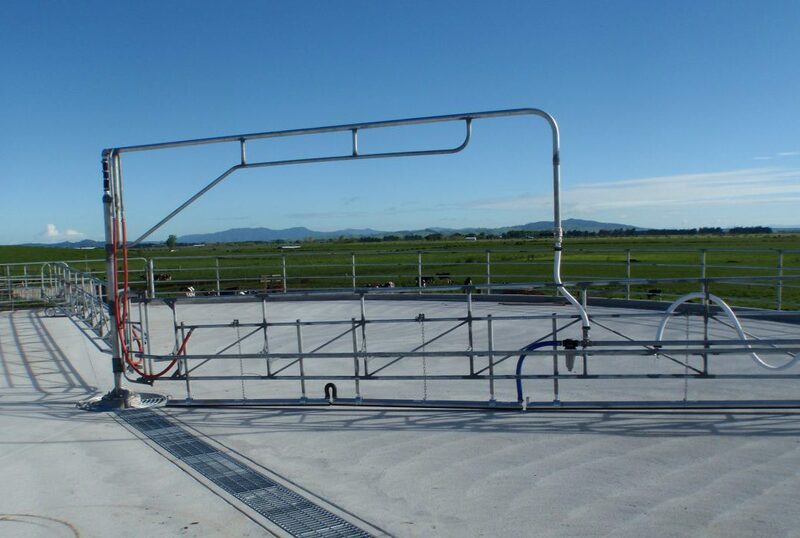 If you’re after a more efficient dairy yard system, take advantage of our vast experience and contact Chapman Dairy™.